I am a regular on eBay and 99% of the time I successfully source items from China. The key for this success rate is knowing what to order and what to expect for your money. 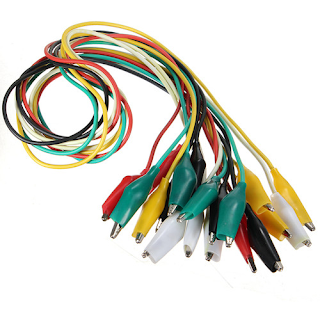 However, recently I ordered a number of test leads from China for about USD2.50 for 10 pieces. My thinking was like this: What can go wrong with a piece of wire? Now I know: a lot! I borrowed this image from a random auction on eBay. However, at close inspection the wires felt a bit soft. At the beginning I didn't pay much attention to this, as I still thought: what can go wrong in with a piece of wire. In most of my projects I use small amounts of current, so for a while the only thing I noticed about these wires is that the joints (where the wires meet the clips) are very flimsy. I easily fixed that with a dab of solder every time a test lead lost connection. And I thought that was it. I couldn't have been more wrong! 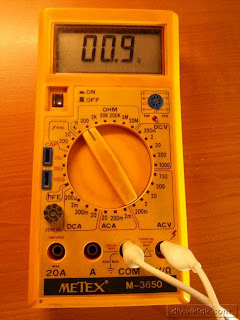 In a recent project of mine I was working with currents of up to 4 amps. 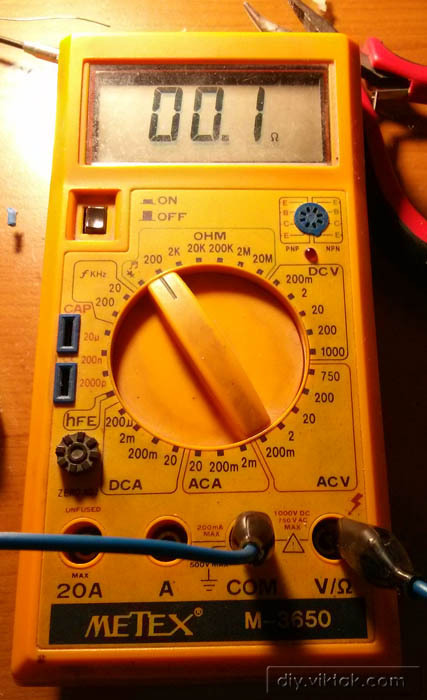 At some point the circuit didn't behave as it should have: despite all the obvious measurements, calculations, checks and re-checks, Ohm's law didn't seem to work. To top all this, one of my test leads burnt my hand when I accidentally touched it (through the insulation!). Frustrated as I was, I started to measure and check the non-obvious parts. 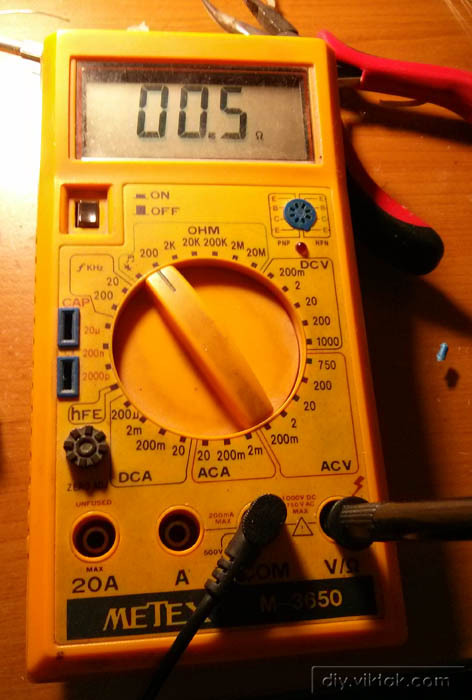 It turned out that the test lead had 0.5 ohm resistance. With the 3 amps flowing through it it dissipated 4.5W of power! Wow! 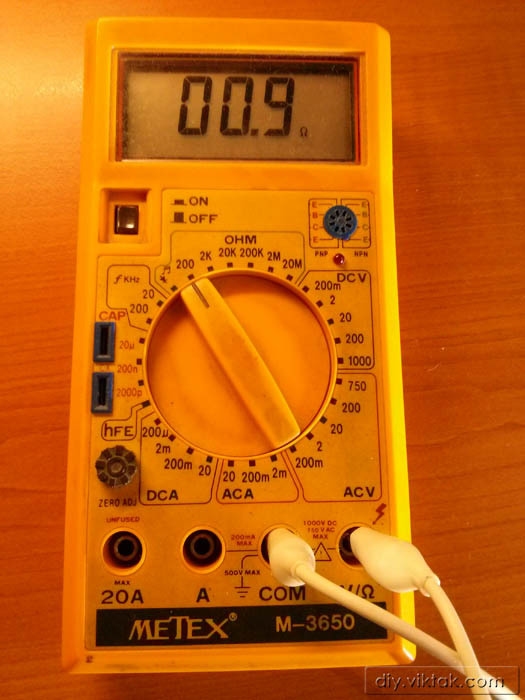 After the measurements above it became very clear to me that these test leads are not usable at all. I thought I could still use the alligator clips at the end (although they are not very sturdy either). But I needed some wires and this time I wanted quality ones. Some even have the protective caps - most of them have never been used. 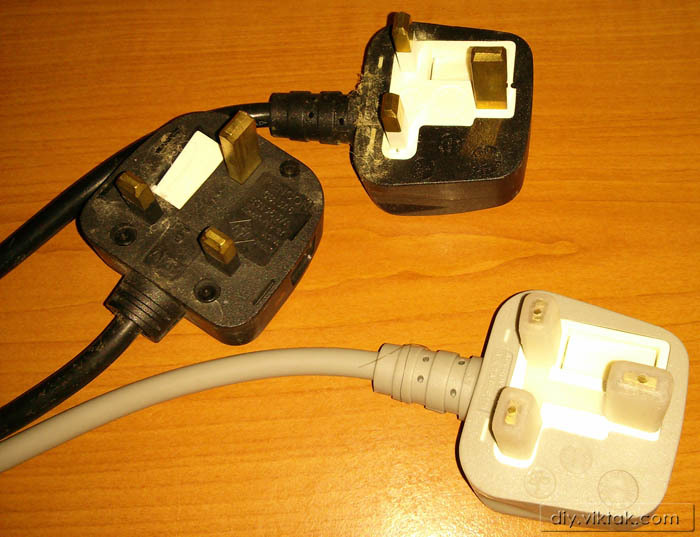 Since these plugs cannot be used in Greece anyway (they are from Ireland where I used to live) they were my first candidates for recycling. The fuses inside of these plugs are rated 10A, so the wires inside should be more than adequate for my projects. 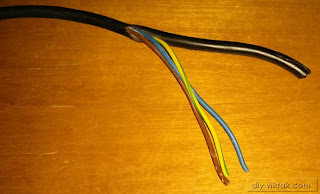 Cut the plugs off the power chords and remove the 3 individual wires from the insulation. The difficult part is to open the first few cm-s of the insulation. After that you can just grab the inner wires in one hand, the insulation in the other and can pull the whole thing out in one move. Pick a color to work with (available colors: blue, brown, green/yellow) and cut it to size. 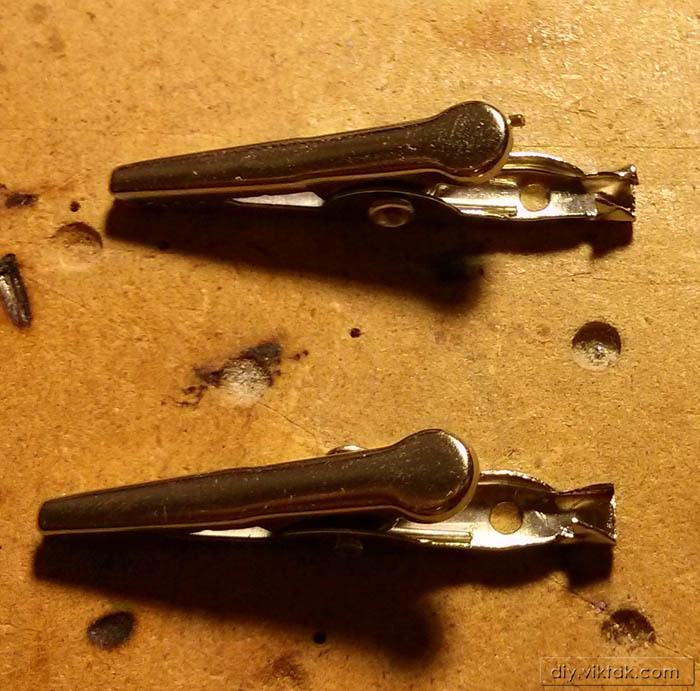 Clean the clips (or banana plugs if you have that) from the original wire. Solder in the new wire. 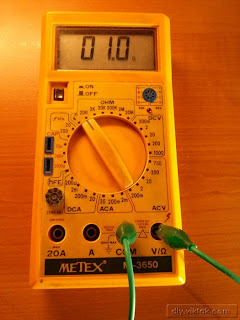 The result is that now I have proper test leads with resistance of less than 0.1 ohm per meter. 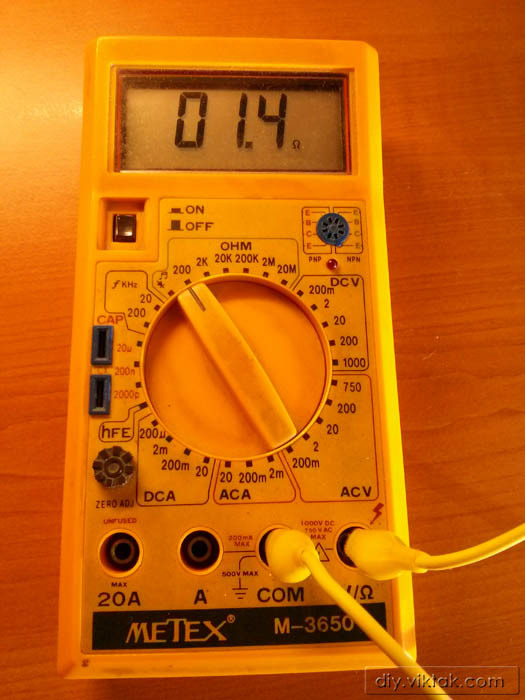 This test lead is more than double the length of the one measured before and its resistance is much, much less. It would dissipate less than 1W @3A. 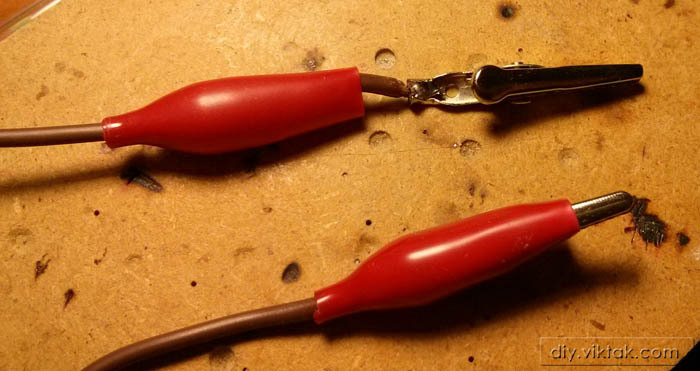 Also, with this method now I can have as many test leads of any length as I want. All this with recycling old materials in my home. And a few minutes' work. I think it's worth it! Good idea, I wound up doing pretty much the same with a set of leads I picked up for work. There's a bunch out there. 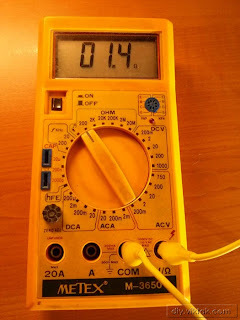 Most use a constant current of 100mA or 1A and (carefully) measure voltage using a technique called 'Kelvin measurement'. Been there, done that. I used wires from old ATX power supplies. They are also speced for over 10 A, have decent insulation and come in a variety of colors. Yes, they are also good ones, the only problem with them is that they are short. Obviously, 1+ meter long test leads are not always necessary, so one could live without them. Support the development of my future projects! If you find my project useful, please consider supporting my projects and articles with a couple of euros/dollars. Even the smallest amount helps me create new projects which I will share with the community completely free of charge. You can tell me which project you would like your support to help, otherwise it will be used for a random project. However, don't feel obliged to do so, I'm already happy to know you are interested in my article. In any case, your help is much appreciated! Maintaining this blog takes time and money. I don't intend to make money on this blog, but I would like to break even. One way of helping me is that you use the below referral links when you want to sign up for any of the below services anyway. This doesn't cost you anything, it helps me a bit and in most cases you also get some discount. Welcome to my D.I.Y. pages!